Farmhouse Cingoli is located in the open countryside, surrounded by hemp fields and olive trees, with its untouched panorama, immersed into a green rural area and spreading a feeling of openness and freedom all around. We offer for sale this stone country house to renovate, over a surface of averagely 200 square meters with the opportunity to enlarge the building for 30% of its present surface. The property includes a plot of land of 3050 square meters, but you buy a larger plot (price range is Euro 22.000 to Euro 25.000 per hectare, i.e. 1 hectare is 10.000 square meters). 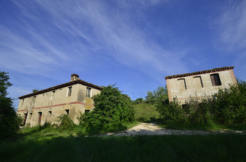 Farmhouse Cingoli is 200 square meters and has to be demolished and rebuilt. You could take advantage of the Italian law which allows you to rebuild a house in compliance to modern and earthquake-proof technologies, energy efficiency standards, keeping untouched the rural feeling and appearance of the typical house in the region Marche, reusing the original materials for the external building, such as roof tiles, beams and stones. You could also choose a different shape for the building, in order to fit your needs, so that spaces become more efficient and cost effective. We at Marche Country Homes can offer every service you need to design your house. Please contact us and we will help you in choosing what you should do best.